Inspired Eye Photography magazine exists to showcase the work of the community, to learn, to teach, to inspire and to be inspired from it. Every issue of Inspired Eye is an adventure in Photography. The 18th issue of the magazine travels to Thailand with the aethereal images of Patricia Hudson Clarke, then goes to Japan for some surreal images of the Seto Art Festival. Cover to cover there is interviews of NYC photographer Mike Lee, expat french photographer Florian Gautier, Paola Saetti from Italy and much more. Read the magazine and gain collective wisdom from a variety of photographers. 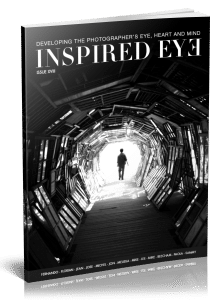 This edition is 340 pages (170 spreads) that are beautifully laid out, this issue of Inspired eye will enrich your photography.